STATESBORO, Ga. — No. 25 Appalachian State suffered its first Sun Belt Conference loss of the season Thursday, falling 34-14 at league co-leader Georgia Southern. Anthony Flory had a team-high 10 tackles for the Mountaineers, who were playing their first game as a ranked team at the FBS level. They lost starting quarterback Zac Thomas to an injury three plays into the game and second-leading tackler Jordan Fehr to a targeting penalty in the first quarter. Georgia Southern finished with 24 points off the five turnovers it forced, and App State was held to 288 yards of offense. Peyton Derrick and Jacob Huesman took snaps at quarterback the rest of the way after Thomas left the game, and Huesman threw a 4-yard touchdown pass to Malik Williams with 10 seconds remaining. The Mountaineers (5-2, 3-1) return to action Nov. 3 at Coastal Carolina (4-3, 1-2). Demetrius Taylor’s blocked punt and D’Marco Jackson’s 15-yard return to the Georgia Southern 31 created the first scoring opportunity on a rainy night at Paulson Stadium. The Eagles (7-1, 4-0) immediately followed a goalline interception and long return to start the second quarter with ShaiWerts‘ 57-yard touchdown pass to Darion Anderson. App State answered back quickly, using Marcus Williams Jr.’s 23-yard run and backup quarterback Derrick’s 50-yard pass to Corey Sutton to set up a 1-yard touchdown run from Williams. App State’s defense forced a three-and-out, with MyQuon Stout and Flory converging for the stop on a third-and-3 carry, but the Eagles made a fumble recovery at the Mountaineers’ 10 following a muffed punt in heavy traffic. Wesley Fields’ 10-yard touchdown run on the next play put Georgia Southern ahead for good, and a three-and-out possession preceded a six-play scoring drive for the Eagles, who took a 17-7 lead on Tyler Bass’ 42-yard field goal. After Georgia Southern forced a three-and-out to open the second half, Fields rushed for 32 yards on a third-and-7 conversion and Werts scored on a 47-yard option keeper. The Eagles moved ahead 27-7 late in the third quarter on a 43-yard field goal that followed an interception on a tipped pass. Huesman took over at quarterback for App State late in the third quarter, and one of the Eagles’ four interceptions set up Fields’ 18-yard touchdown run with 3:28 remaining. Huesman led a late scoring drive and threw the first touchdown pass of his career in the closing seconds. 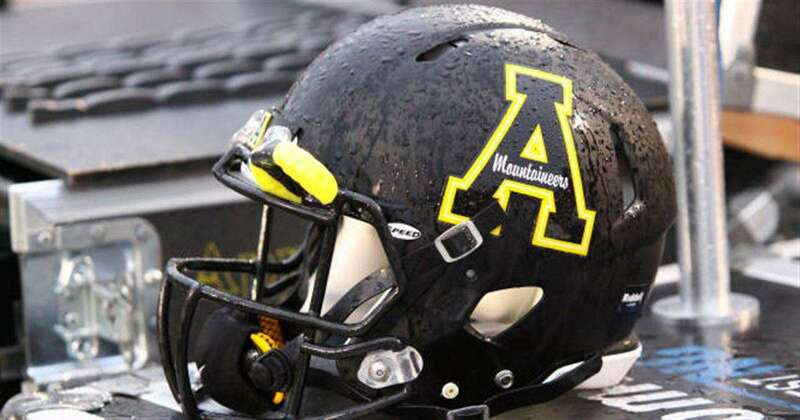 Appalachian State is now 30-4 in its last 34 conference games and 14-3 in its last 17 conference road games. A week after batting down two passes, Demetrius Taylor recorded the first blocked punt of his career. With Steven Jones blocking two punts against Gardner-Webb and Tae Hayes blocking a field goal against South Alabama, the Mountaineers have four blocked kicks this season, a total that’s tied for third place nationally. Corey Sutton, who entered the game with a yards-per-catch average of 21.53 that ranked No. 9 in the nation, had his third reception of at least 40 yards this season. He hauled in a 50-yard reception to set up a first-half touchdown. Cole Garrison, a sophomore, made his first career start at right guard.